Bird-watching for the zippy little hummingbird is a rewarding challenge. 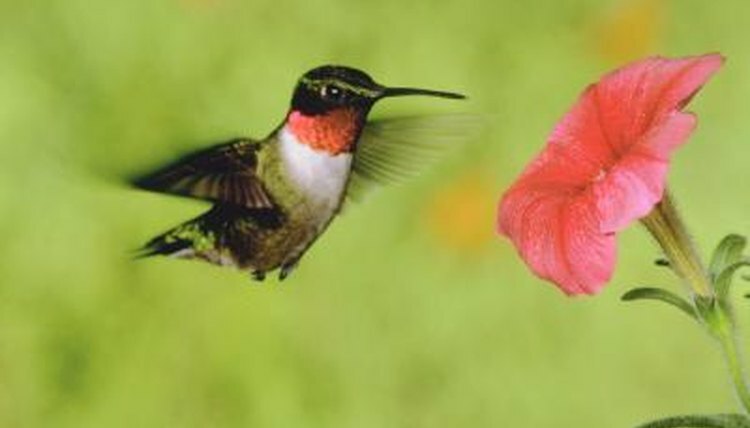 Of more than 300 species worldwide most hummers live in South America, but many make the journey to North America to breed in the spring and live throughout the summer. Accurately identifying hummingbirds is a matter of noting their size, coloration, location and flight patterns. How far north you live and the time of year determine how likely it is for you to see a migratory hummingbird. If you live in the western United States or Canada, there are 16 migratory hummingbird species you may spot. Each species has a particular range across which it travels. Hummingbirds start their trek northward in late February and arrive at the northernmost points of their range by May. The trip back begins in late July, and they tend to reach their winter home by November. When you witness a hummingbird in flight or feeding, it's immediately clear that this bird is unlike the rest. The hummer's ability to hover and fly backward is unique among birds. The small size is another giveaway that you're looking at a hummer and not another high-speed bird. The third telltale sign is the extra long, extra thin hummingbird beak, which is ideal for licking up nectar from tubular flowers like the trumpet vine. The brighter the color and sweeter the nectar, the greater the chance a hummingbird will visit the flower. The hum sound, another indicator that a hummingbird is close by, comes from the rapid beating of its wings. These birds can chirp, but they have no true song. Their vocalizations sound like short, quiet squeaks. When identifying hummingbirds at a glance, the key colors to note are the back, throat, gorget (area just below the throat), breast and head. For example, the male Allen's hummingbird (Selasphorus sasin) has a reddish-orange gorget, green back, white chest and reddish-brown belly. The female has no red or green, and has a white belly and brown-spotted throat. The male black-chinned hummingbird (Archilochus alexandri) is light gray, with an iridescent blackish purple head and throat and a white chest. The female is white underneath, light gray on the back and head, with light gray spots on the chin. Identification in the United States east of the Mississippi is easy because the ruby-throat (Archilochus colubris) is the only hummer that breeds there. For the male, look for the emerald green head and back, white underbelly, and characteristic deep red gorget. The female is a lighter shade of green with a totally white underside. Many a bird enthusiast has been fooled by the hummer's insect look-alike -- the hummingbird moth. Also called the sphinx or hawkmoth, these tricky insects are colored like hummingbirds, beat their wings incredibly quickly, can hover and dart, are active during the daytime and eat from the same flowers as hummers. The quickest way to spot a fake is to note the animal's size. If you think you're seeing an impossibly small hummingbird, chances are it's a moth imposter. Closer examination reveals the insect's antennae and six legs in place of the hummer's two tiny feet tucked close to the body. Two typical fakes are the clearwing hawkmoth (Hemaris thysbe) and the Nessus sphinx moth (Amphion floridensis). The Hummingbird Society: A Tiny Hummer? Butterflies and Moths of North America: I Saw a Moth That Looks Like a Hummingbird. What Is It?